Leaf form is closely related to local prevailing abiotic conditions and thus the morphology of fossil and sub-fossil leaves is often used to reconstruct both historical and palaeo-environmental conditions. 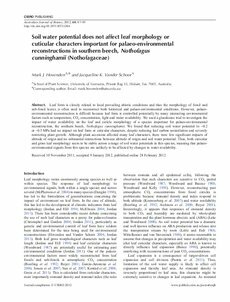 However, palaeoenvironmental reconstruction is difficult because leaf form is controlled potentially by many interacting environmental factors such as temperature, CO2 concentration, light and water availability. We used a glasshouse trial to investigate the impact of water availability on the leaf and cuticle morphology of a species important for palaeo-environmental reconstruction, the southern beech, Nothofagus cunninghamii. We found that reducing soil water potential to �2 or �5 MPa had no impact on leaf form or cuticular characters, despite reducing leaf carbon assimilation and severely restricting plant growth. Although plant accession affected many leaf characters, there were few significant impacts of altitude of origin and no substantial interactions between altitude of origin and soil water potential. Thus, both cuticular and gross leaf morphology seem to be stable across a range of soil water potentials in this species, meaning that palaeoenvironmental signals from this species are unlikely to be affected by changes in water availability.